>Plastic coating can be done to many base wire mesh or sheet metal materials. Our plastic powder coated steel wire mesh introduced in this page include welded wire mesh and perforated metal. >All kinds of colors can be coated according to customers' special requirements. >All products are produced in renowned factory at least with more than 20 years' manufacturing experience to guarantee stable quality, packing, labeling and delivery. >We are professional supplier of garden hardware. All our products are exported to overseas which are mainly exported to European market ,USA market and other countries with good quality and competitive prices. >Main Applications: various cable carriage, rope and belt conveyer, ropeway drawing, slope winch, etc. 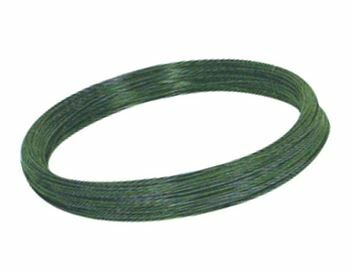 >Thanks to the high quality, high strength and strong durability of our plastic coated steel wire. > Our products has owned good reputation among various customers in the world. Welcome to buy quality and newest plastic coated steel wire from our professional factory.